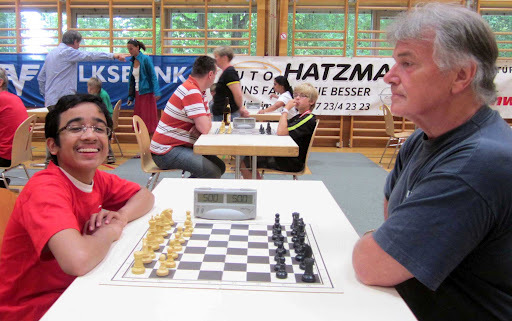 The final chess tournament of my European Summer 2012 trip was in the small city of Branau Am Inn, Austria. The weather was great during early August. 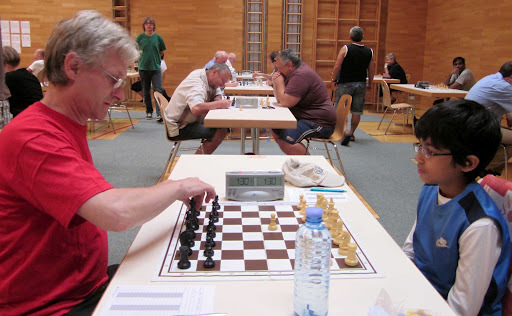 The great thing about the Braunau Open Chess Tournament was its high concentration of chess Grandmasters (GMs) – most of the higher rated players above me were GMs! The organizers should be credited with being able to attract 9 GMs and 4 International Masters (IMs), out of a total of 40 players. 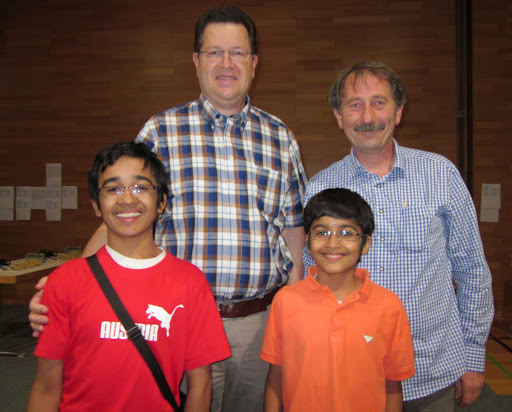 This is what attracted me to this chess tournament – the opportunity to play some highly-experienced and titled players. I must say the experience was great! Although I played with only 3 GMs and not more, that was my mistake. The first round was with a local opponent who had a lower ELO, but was quite strong and it definitely wasn’t an easy game. 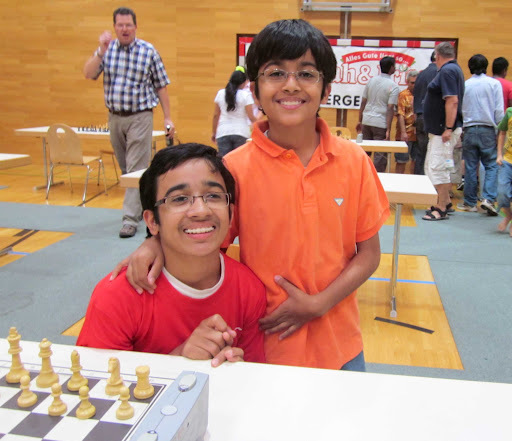 In the next round, I played with Indian GM Neelotpal Das. I was playing White. We went into a line which I was fairly comfortable with and after shuffling the pieces around for a while I moved further into a line of attack which looked quite promising. After all, who doesn’t like advancing pawns towards the opponent’s King 🙂 GM Das offered me a Draw and I realized that my line of attack was not going to materialize into anything concrete as he had adequate counterplay. After a 20-minute think, I accepted the Draw offer. A self-analysis later in my room confirmed this with a 0.00 evaluation. Next round I was up against the Senior World Chess Champion GM Vladimir Okhotnik. Oldest vs Youngest! There was a lot to play here for. GM Okhotnik misplayed the opening and I had a dominating advantage. Unfortunately, I missed the win and messed up the middle-game. Oh, how painful it was. Anyhow, we went into a rook endgame which I misplayed again (not good), but luckily I managed to reach Philidor’s position which is like the elementary ABC of rook endgames. I was relaxed now since I knew this was a Draw, and the Phildor position in Chess is something which a player at my level knows fairly comfortably. But I didn’t realize there is an impulsive child lurking in my head. I just wanted to get the game over with now, since it was a straight-forward Draw. The first mistake was when I moved my Rook away from the 6th rank – oh, how impulsive. That vaporized the chance of a simple Draw. The easiest way for a Draw was just to leave the Rook on the 6th rank. When GM Okhotnik placed his rook on the 6th rank, I moved my King up without thinking. Yes, without thinking! Really, this was a weak and silly move, as I assumed I would still be able to hold the Phildor position. I just didn’t think. The GM’s King came back to where it was and suddenly it hit me that I had committed a serious error of judgement. Psychologically I broke down. That breakdown was the second mistake, because there was still an opportunity to Draw if I had stayed calm. Even though things were now a bit complicated, a Draw was still possible. I just didn’t realize the possibility, and unfortunately resigned. Extremely crushing since it was such a golden opportunity, and I wasn’t outplayed by GM Okhotnik. I went from a potential Win, to a straight-forward Draw, to a devastating Loss. I wanted to highlight this game because there were lots of lessons I learnt from this one chess game. The Game A’int Over Till We Give Up. Perhaps some fellow chess players who read can avoid the composure mistakes that I made. Thereafter, everything was a bit of struggle. Was it fatigue of being out on-the-road for many weeks or just a tired mind after a crushing loss. Perhaps a combination. My Chess was not sharp anymore. Next round I barely managed to beat a lower rated – the win felt good because I could bounce back. I then played GM Sergey Kasparov. Unfortunately I couldn’t prevail – I wasn’t calculating deep enough and missing things which I shouldn’t have overlooked. It was getting hard to even think deep. In other words, the message was clear – it was time to rest and recharge. 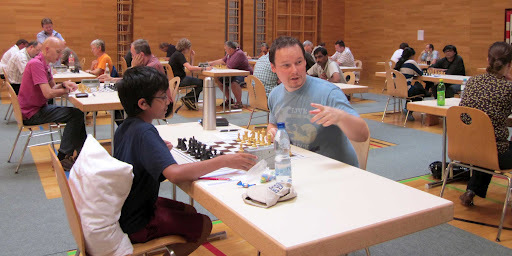 Johann Maierhofer playing with Akshat Chandra. and my slip-up gave him a Win. Well, good for him. I muddled through the rest of the tournament with some uninspiring games. The final tournament of my European trip was not the going-out-with-a-bang kind. Despite my tournament not going well, it was a good experience overall. The organizers, Norbert Fruhauf and Gerhard Spiesberger were very helpful and polite, and were always ready to assist us. It felt like so many people of this small-town got involved, including the families of organizers, in order to make this tournament a great success. 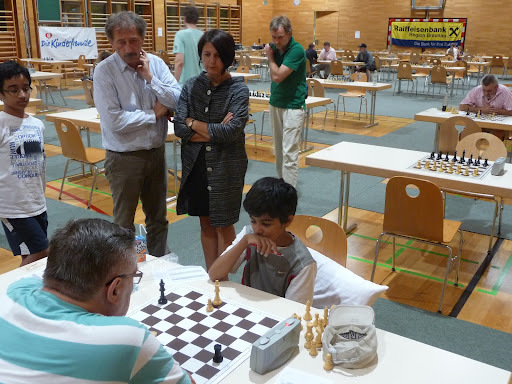 Braunau had never seen such a high-level tournament before, and the organizing team did a wonderful job. They made the city proud. I would strongly recommend and hope that they continue this wonderful tournament in future years. It’s not easy to do such a big tournament in a small town, and of course it means a lot of hard work. But it was an outstanding tournament. Norbert Fruhauf and Gerhard Spiesberger. Well Done Norbert and Gerhard! 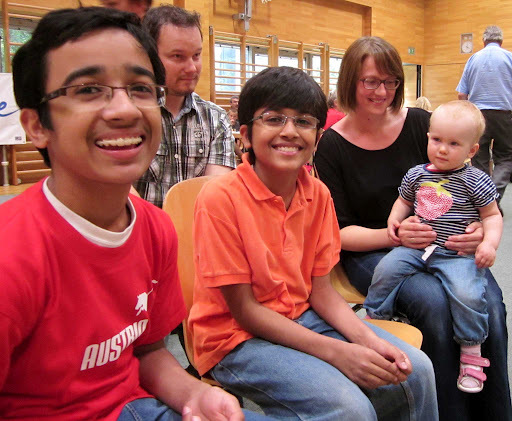 My family and I left for Munich thereafter for sometime, and eventually headed home. Many of my friends from Europe have been in touch. 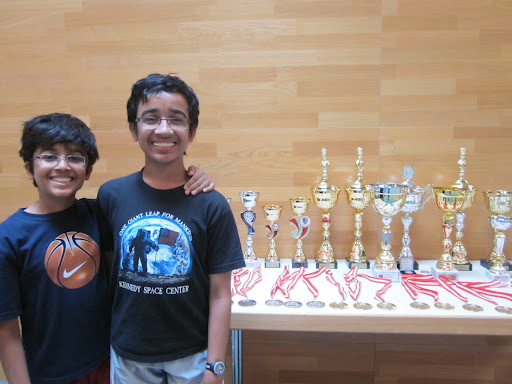 A few of them played in the World Olympiad in Turkey in Aug-Sep 2012. I wish them luck! As a side note, we had a bad experience at the local Hotel Neussl also called Hotel AM Theater Park. So if you ever go to Braunau, do not stay at Hotel AM Theater Park or Hotel Neussl – it’s a crazy place. 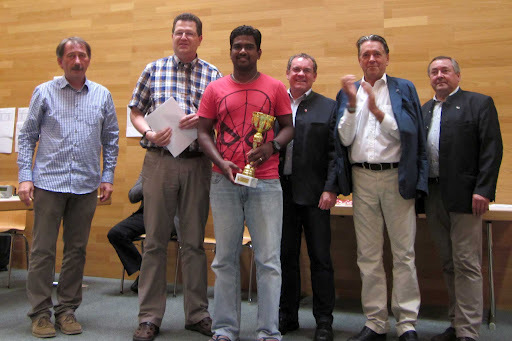 GM Panchanathan Magesh Chandran – the tournament winner. His style of play – it ain’t over till the last game. 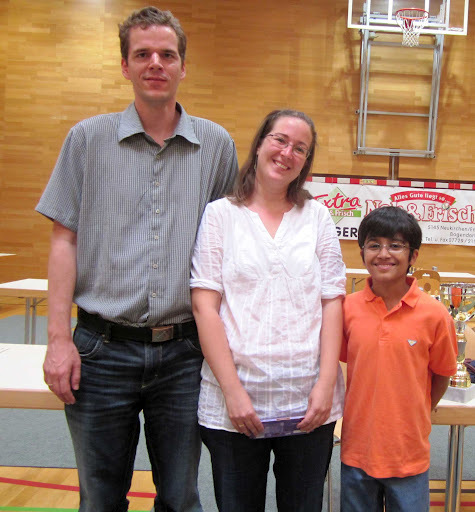 It’s me, Akshat, with GM Medvegy Zoltan and WFM Emese Balogh. Emese was so kind and wonderful to us throughout the tournament. 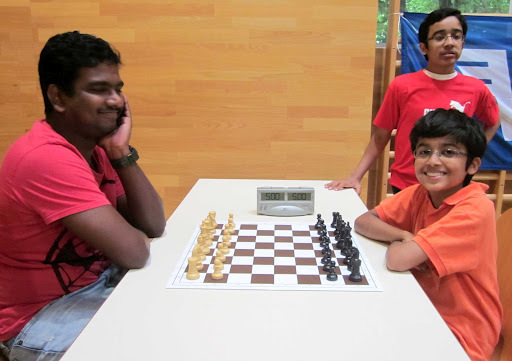 Getting ready to play blitz – the genial GM Magesh vs Akshat. 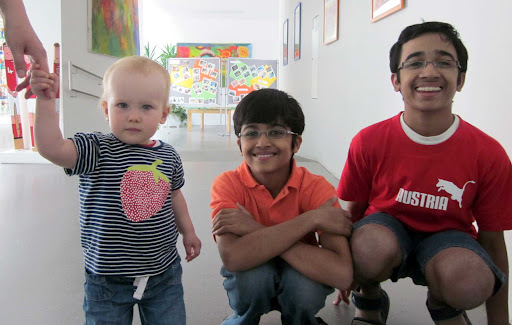 Merrymaking in Munich! 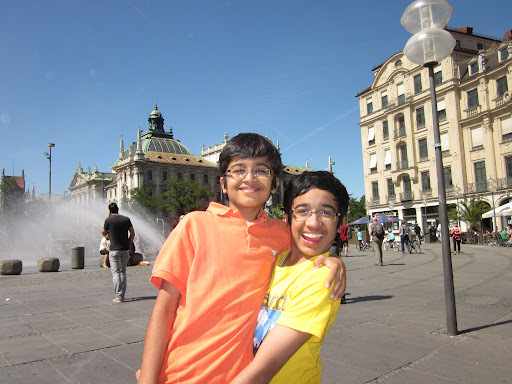 Akshat and Aditya.